We were very satisfied with the kit we received and are currently conducting an experiment with it. It was easy for my son to do and he had fun while hewas learning. I am the Grandmother to a 9 1/2 year 3rd grader. When she said she wanted to do her Science Fair Project on bacteria titled "unwanted house guests", I decided to go on the internet and there I found the Science Guy. While everything she needed came in the package, we could of used a few more swabs. But other than that, the kit was great, down to the instruction sheet. We will order again from the Science Guy when the time comes. Oh, and by the way...my Grandaughter won 1st Place out of 50 entries! We bought this so my son could test 5 different objects to see which one had the most bacteria. He won 1st place out of 4 schools for his project. It was easy to use and the instructions were easy to read. My daughter used the bacteria growing kit to figure out which cleaner cleaned our kitchen counter of germs the best. The instructions are clear and easy to follow. (We boiled over some of the agar, but there was plenty left.) It is interesting watching and charting the samples (colonies) as they grow. We will go to present to the judges at the end of next week. Thanks for a great product. I wanted to e-mail to let you know how pleased we were with your product! 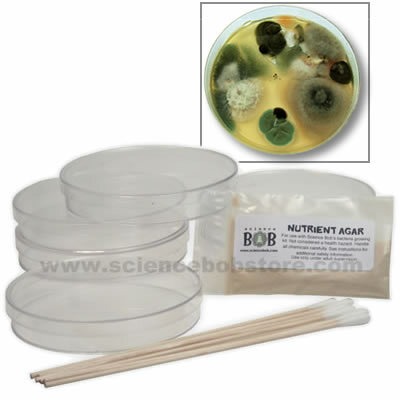 We purchased the Science Bob Bacteria Growing Kit Science Fair Size. My daughters project was titled "Wash Your Hands!" and it won the 3rd grade Science Fair at her Elementary School in New York! The directions were easy to follow & it was fun to watch the germs grow. Her project is now going to Brookhaven National Laboratory for further judging....we hope she will place in that fair as well! Thanks again! Well my daughter, Carmen, was doing a project and she had her topic, is there more bacteria in tap water than regular water, and she won 1st place in the fair. Thank you sooooooo much!